Editor’s Note: the following is a transcript of the prepared remarks to the graduating class of 2014, delivered on 23 May 2014, by Rev. Peter Yuichi Clark. Rev. 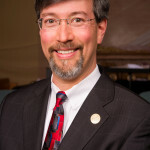 Clark is Professor of Pastoral Care at the American Baptist Seminary of the West, Graduate Theological Union, and Manager of Spiritual Care Services at UCSF Medical Center and UCSF Benioff Children’s Hospitals in San Francisco. Posted by permission of the author, copyright (c) 2014, Peter Yuichi Clark. Good morning! I am very pleased and privileged and, to be honest, a bit humbled to stand here with you today on the occasion of your graduation from the Institute of Buddhist Studies. This is simultaneously a solemn and festive event, marking the completion of an academic journey – the papers are written and the tests taken, hurrah! – and the start of what we all trust will be a lifelong pilgrimage of learning, teaching, and serving others in keeping with the bodhisattva ideal. Some people say that those who do not read and study the sūtras and commentaries cannot be ascertained of birth in the Pure Land. This view is hardly worthy of serious consideration. All the sūtras which reveal the essentials of the truth of Other Power simply state: By saying the nembutsu and entrusting oneself to the Primal Vow, one attains Buddhahood. What further knowledge is required for birth in the Pure Land? Truly, those who are still confused about this should by all means study hard to realize the purpose of the Primal Vow. If the true meaning of the sacred texts is not clearly understood, even though one reads and studies, it is to be pitied. Since the Name is devised to be easily said by the unlettered who cannot even grasp the basic meaning of the sūtras and commentaries, such utterance is called “easy practice.” Learning is required in the Path of Sages; therefore, it is called “difficult practice.” Some people mistakenly pursue knowledge for the sake of fame and profit—their birth in the next life is doubtful, so states an attesting passage…. Is the only purpose of knowledge to defend against criticism and to engage in arguments and debates? If a person studies properly, he or she will come to see more clearly the intention of [Amida] Buddha and realize the boundlessness of true compassion. Such a student will teach those who are unsure of birth in the Pure Land because of their defiled nature that the Primal Vow does not discriminate between the good and evil, the pure and impure. Only then will knowledge be meaningful…. Three months after I finished my Master of Divinity degree at a Baptist seminary, I embarked on a year of Clinical Pastoral Education training at the Emory University Hospitals in Atlanta. It was an intensive year of experience as a hospital chaplain where I visited with patients and their loved ones, and I sought to offer emotional and spiritual support to people in all different kinds of crises. It was a challenging, exhilarating, and formative year for me – one that shaped the direction of my career. During that year, while doing my morning rounds, I met with a patient who was coping with a very serious illness and facing a dire prognosis. As he told me about his symptoms and what the doctors had said his future might be like, I was struck by the sheer amount and force of his suffering. I tried to be present to him, to hear his story and to convey to him that he mattered, that I cared. Then, after he had recounted the details of his treatment for some time, he asked me the question that almost all chaplains secretly dread hearing from patients: “Chaplain, why did God let this happen to me?” This is the question that all of the world’s religions seek to address in their various ways: what meaning do we find in the pain and suffering we encounter? Buddhists rely upon the Four Noble Truths; Jews have the books of Psalms and Job, and the Talmudic debates of the rabbis; Christians have their own set of perspectives, collectively known as theodicy. People of faith have labored over these kinds of questions for centuries, and I had just spent four years at seminary studying and learning about those responses. When I heard this patient’s question, I felt fearful, but I also was confident. This was a question I had prepared – and been prepared by my teachers – to answer. So I did. I talked for several minutes, reviewing the theological assumptions he and I shared as Christians, and reassuring him about God’s grace and providence and love. Given that I had not rehearsed my statements in advance, I thought I did a good job of being clear, convincing, and comforting. The patient looked at me and nodded, and then he politely thanked me and said he was tired and needed to rest. I took his cue and I left the room… and I was utterly baffled. What was wrong? I had addressed his explicitly stated need and answered his question. So why did our conversation sputter and fade so quickly? Later, when I mentioned this incident to my supervisor and peers, they replied: “You answered the question he asked, but you didn’t answer his real question.” In other words, I heard the content of his query and I responded to “fill in” the cognitive gaps I perceived in his theology. Rather than really listen to the despair, loneliness, and hunger for connection in his voice – rather than sit with him in the depths of his confusion, sadness, and anger – I used my extensive (and expensive) theological training to soar right over his pain and suffering. No wonder he kicked me out! Clearly I do not tell this story because I am proud of what I did. I share it because I believe it illustrates a powerful truth, a truth that the author of Tannishō is telling us from eight centuries ago, a truth that all of us who are engaged in the pursuit of knowledge should heed. Simply put, that truth is: Knowledge is the servant of wisdom and compassion, not their master. “All well and good, Preacher,” you might say to me. “But what does that look like in real life?” That is a fair question, and here I think Tannishō and other Buddhist teachings can give us some concrete guidance. As you prepare to leave this school and venture out into the phenomenal world of samsāra, I would draw our attention to four corollaries to this law of relation between knowledge, wisdom, and compassion. The first corollary is that knowledge can promote wisdom, but it also can mislead us if we use it inappropriately. The author of Tannishō underscores this by reminding us that we can pursue knowledge for all sorts of reasons: “for fame or profit,” or “to defend against criticism and to engage in arguments and debates,” or ideally to benefit other sentient beings. In my case, I thought I was following worthily in the steps of the great English poet John Milton, who aspired to “assert Eternal Providence and justifie the wayes of God to man,”(2) but in reality I was actually using my knowledge to shield myself. This raises an uncomfortable truth, which is that I can have more than one intention at any given time. I do not believe that I was trying to be callous or uncaring; in the moment, I actually thought I was helping. Yet we can have mixed motives; consciously I wanted to assist the patient, while unconsciously I wanted to protect myself, and my mixed motives led me to an unskillful use of my schooling. To frame this insight in a more pithy and memorable way: What we do matters, and why we do it also matters: both our intent and our impact. The second corollary is that knowledge is upāya, an expedient means that requires discernment. This is illustrated wonderfully by Śākyamuni Buddha’s famous parable, in which a father saves his children from a burning house by telling them a lie. He yells that he has playthings for them, and they run out of the house to claim their promised toys. Later, though, the father gives each of his sons a beautifully adorned carriage with a white ox to draw it. (3) If I may be so presumptuous as to interpret the Buddha, the point of the parable seems to be that we can utilize our knowledge to generate merit, but doing so demands that we use it in the right manner and in the right amount. Tannishō says the same thing by distinguishing between “easy” practice and “difficult” practice, and recognizing that while other teachings may be “superb,” the nembutsu fits the needs of “foolish beings” like ourselves. I shall follow the Buddha’s example and speak metaphorically: part of my error in the story of that patient was that he was asking me for a roadmap to help him figure out his next steps. Instead, I gave him an encyclopedia. Like everyone who seeks our care, he begs us to utilize our knowledge. In order to do that, we need to be discerning, in its etymological sense. In its Latin root, to discern means to “separate out.” We need to be able to separate out what is essential and expedient. This takes continuous practice, and the humility to keep learning: wisdom, in other words. As Einstein once wrote, “Wisdom is not a product of schooling but of the lifelong attempt to acquire it.”(4) Growing in wisdom enables us to employ our knowledge so as to embody compassion. Third, knowledge is relational; we learn in connection with others. As is true of almost all of the world’s sacred texts, Tannishō is an effort to preserve the legacy of a wise teacher. The writer wanted to capture Shinran’s words before they faded from memory, so that his knowledge could keep us from falling into error. You graduates have spent the past several years in this academic community, learning beside your peers and with your professors. As you embark onto what I hope will be a long and fruitful career, the lessons that you take with you are woven together with the people who helped you to learn them. This is a wondrous thing. I hope you will cherish it. To put a Buddhist spin on it: the dharma is always connected to the sangha. In my line of work, we have a saying: “The patients are our teachers.” And this is certainly true for me. I met that patient over twenty years ago, and it is very possible that he is now dead. Yet his voice sings in me, and he continues to teach me. The lesson I learned with him lives in me, because I remember what happened between us. The man was clinging to his knowledge of the Jewish law as a way to shield himself and stay secure in his position. Jesus invites him instead to risk himself in the service of others, to step beyond his knowledge and really live his life guided by compassion. And the man walks away, not able on that day to summon his courage and take that risk. The gospel does not tell us the man’s name, and as far as we know, we do not have any record of his fate after this conversation. It is an unfinished story. We can wonder if, perhaps, the lesson penetrated his soul at a later point. I hope so. In my case, I do not know what ultimately happened to the patient I met. After he had dismissed me, I did not see him again. Yet because of him I learned that all of my theological training, to which so much money and time had been committed, is a form of “wealth” that could either serve others, or hinder me from being the kind of person and minister I want to be. The choice was mine to make then, and it is a choice that I continue to face regularly in my chaplaincy work now. You and I have received great riches because of the training that is provided here, and throughout the Graduate Theological Union, and at many other schools of religion in the world. But we have been entrusted with these riches – we do not own them – and it is our task now to invest our wealth in worthy ways. You and I know, of course, that the best investment is to apply our knowledge in the service of wisdom and compassion. That is our desire, our aim, our aspiration. And, as the story of Jesus and the rich young ruler tells us, we will need courage in order to live that kind of life. (1) Excerpts from chapter 12 as presented in Tannishō: A Shin Buddhist Classic, translated by Taitetsu Unno (Honolulu: Buddhist Study Center Press, 1996), pp. 18 – 20, with modifications suggested by the version included in Dennis Hirota, Hisao Inagaki, Michio Tokunaga, and Ryushin Uryuzu, editors, in The Collected Works of Shinran, vol. 1 (Kyoto: Jōdo Shinshū Hongwanji-ha, 1997), pp. 668 – 670. (2) Paradise Lost, book 1, lines 25 – 26 (1674 edition). (3) Lotus Sūtra (Saddharma Puṇḍarīka Sūtra), chapter 3, composed ca. 2nd – 3rd centuries C.E. (4) Excerpted from a letter to Joseph Dispentiere dated March 24, 1954. Reference 59-495, Albert Einstein Archives at the Hebrew University of Jerusalem. (5) Mark 10:17 – 23, excerpted from the New Revised Standard Version. Copyright © 1989 by the Division of Christian Education of the National Council of Churches of Christ in the United States of America.